In our sixth in the series of different perspectives on Egyptian potteryValentina Gasperini, a post-doctoral reseracher at the Department of Archaeology, Classics and Egyptology University of Liverpool, looks at a Cypriote pottery vessel found in Egypt. 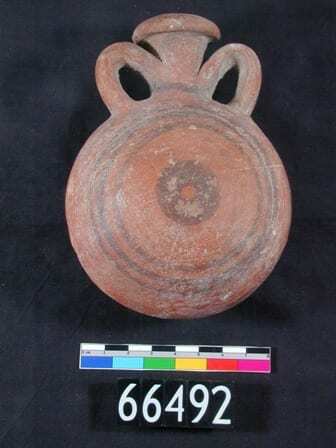 As a ceramicist interested in trade and exchange, particularly at the site of Gurob (located at the entrance to the Fayum region), I would like to present a Cypriot juglet found there during Dynasty 18 (c. 1550–1292 BC) and currently located in the Petrie Museum. This vessel can be studied from a variety of viewpoints and it provides important clues about chronology, social needs and changes in fashion. UC13441 was found at Gurob, most probably during the Brunton and Engelbach archaeological campaign of 1920. When dealing with these early excavations the job of a ceramicist often becomes like that of a detective. By cross-examining the excavation reports and a series of clues, I have been able to trace the original context of discovery of this item: Gurob tomb 603. A well-travelled pottery vessel currently in the Petrie Museum, London, excavated in Egypt, but made in Cyprus more than 3000 years ago. In the third in our series of different perspectives on Egyptian pottery Mary Ownby, Petrographic Researcher at Desert Archaeology Inc, and Bettina Bader, Institut für Ägyptologie der Universität Wien, investigate the purpose of vessels that Egyptologists find puzzling. Analysis of Egyptian pottery provides great insight into how the Egyptians worked, ate, carried out religious activities, and related to the larger social and economic system. For most vessels, their shape can inform on their use, i.e. a jar is probably for storage, a large pot with a narrow opening for cooking, and bowls and plates for serving food. The location where ancient pottery has been found can also inform on how it was used, for example in an oven, or as ritual implements in the burial. In Egypt, depictions on tomb and temple walls as well as some texts also tell us about the variety of purposes ceramic vessels were used for. 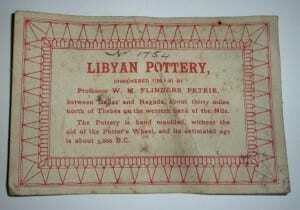 Thus, most ancient Egyptian pottery has a fairly clear use in the past. Pots being put to good use. Bread making scene from the Old Kingdom Tomb of Ti at Saqqara. A garage in Cornwall, UK, seems an unlikely place for a piece of prehistoric Egyptian culture to turn up. But a few months ago it did. 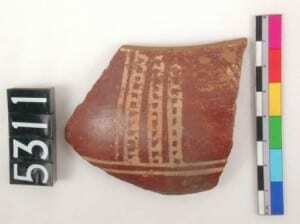 Message in a bottle: label found with a Predynastic pot in Cornwall. A clue! In the second in our series of different perspectives on Egyptian pottery Dr Grazia di Pietro, UCL Marie Curie Research Fellow, looks at what we can learn from incomplete fragments of prehistoric pottery. For museum curators finding room in a gallery for exhibiting nice whole pots can be as challenging as trying to answer questions like: “What was their function, context of use, symbolic meaning?”. Answering these questions is also one of the objectives of pottery specialists researching in field projects or in ceramic analysis laboratories. However – needless to say – the pottery they have to deal with is often very different from what can be observed in a museum case. Let’s go back for a moment to the initial issue: finding space for our pots! Well, they would occupy less room if broken in small pieces and (obviously) even less space if some of these potsherds were discarded or piled in a corner, irrespective of their previous location and sorting… We would eventually have created something similar to that which archaeologists frequently face in an excavation: tons of broken vessels (but still with great informative potential!). 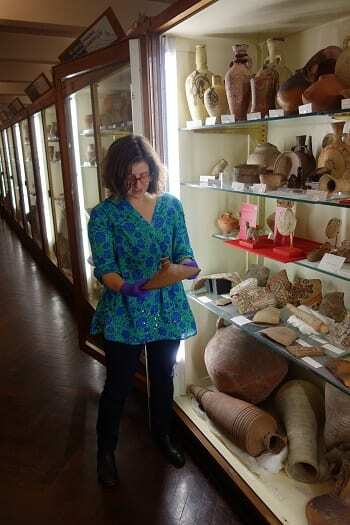 In the first of our series of different perspectives on Egyptian pottery, graduate student Loretta Kilroe looks at pots she is hoping to devote 3 years of doctoral study to. I’m currently researching pilgrim flasks – vessels with a lentoid body, narrow neck, and two handles for suspension. These striking pots first appear in New Kingdom Egypt (c.1550–1069BC). 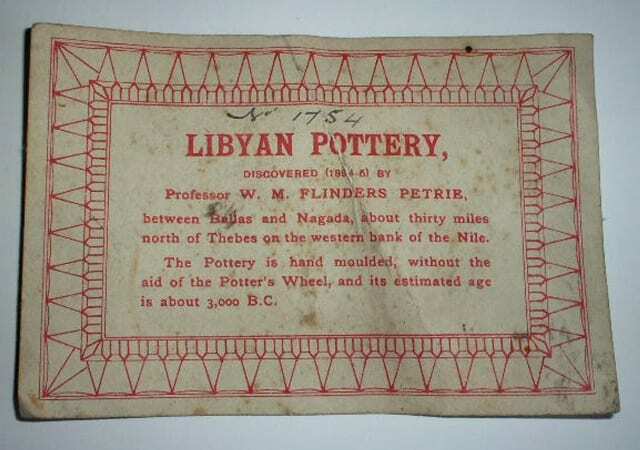 They were originally traded from the Levant, but soon enthusiastically adopted into the traditional repertoire and made by Egyptian potters themselves. One beautifully-preserved flask in the Petrie Museum particularly caught my eye, UC66492.